Copacabana Palace Hotel, Rio de Janeiro, Brazil details from BrazilBookers.com. The Copacabana Palace’s main building has 71 suites and 76 rooms, all equipped with comfortable air conditioning, opening windows, satellite television, phone, wireless internet access, digital safe, mini bar and hair dryer. There is also where you can fine the well furnished banquet center with 10 rooms for banquets, parties, marriages or any other occasions that requires large seating and serving area. A private pool is also offered for the guests of the executive floor. The Tower Building of the famous hotel Copacabana Palace is often referred to as Annex Building. Copacabana Palace hotel is one of the most popular and famous hotels in the world and surely the best hotel in Rio De Janeiro, Brazil. The hotel boasts film stars and royalties as their guests. Facing the Copacabana beach, and at the same time just minutes away from Rio; it enjoys an unparalleled location. The tower wing building or the Annex Building, offers fifty eight suites and forty standard guest rooms. This building is an extension of the main building and has recently been built. All the rooms and suites are equipped with comfortable air conditioning, opening windows, satellite television, voice mail equipped telephones, wireless internet access, a digital safe for your cash and valuables, a mini bar for your entertainment and even a hair dryer. Copacabana Palace has an amazing semi Olympic size swimming pool. It is undoubtedly the best in Rio. Plus there is a tennis court that will invite you to learn the sport for the sake of playing in the beautiful court. For those who wish to pamper themselves can visit the spa or beauty saloon. One can avail the fitness centre if they want to stay in shape after indulging in the food delights offered by the hotel. Every small need including laundry, baby sitting services are taken care of. 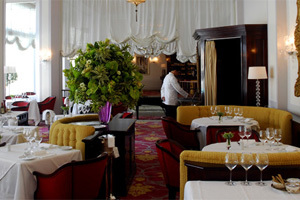 Copacabana Palace also offers luxurious lounges and bars and restaurants. The two of finest restaurants in Rio are here for you. The Hotel Cipriani restaurant, offering a host of northern Italian specialties, often frequented by the cream of Rio and who go back more than satisfied. The Pergula restaurant, situated by the pool, offers international cuisine. Drinks and snacks are served on the pool terrace throughout the day. Both are unique in their cuisines and serve happiness and delight on their platters. The services offered by the staff are commendable. The staff is professional and well trained to cater to all your needs and not give you any reason to complain. You can choose to dine in the comfort of the room by asking the room service. One can indulge in water sports nearby. You can go for body boarding, enjoy a cruise or have fun snorkelling. One can also enjoy golf or feel the soft sand while playing beach volleyball or beach football. This spectacular hotel lives up to its “palace” title. It makes you feel like a king who is presented the best services, the best food, the best staff and the grandest luxuries. When would you like to stay at Copacabana Palace (Main Build) Hotel ? 1) Rates at the Copacabana Palace (Main Build) Hotel may not be valid during Carnival, New Years, Easter and other special dates. © Copyright Bookers International, LLC. All Rights Reserved – Information on Copacabana Palace Hotel, Rio de Janeiro, Brazil details from BrazilBookers.com.